From the moment we fire up NetEnt’s Jimi Hendrix Slot, we are captivated. 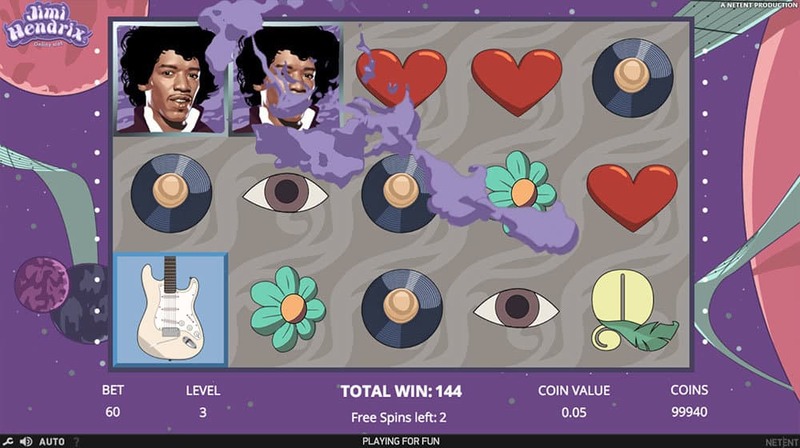 NetEnt is one slots studio that loves an intro, and the onset to the Jimi Hendrix slot is as epic as one of the guitar maestro’s legendary solos. Framed by the moon and the stars, Jimi leads us like a Pied Piper into his slot, the second in the NetEnt Rocks Tour series. There, we are treated to a psychedelic dream. A dream that sees multiple versions of Jimi rock our worlds, peppered with numerous bonus features that will leave us spellbound, both musically and numerically. Jimi Hendrix, like many artists in the 60s, was known for his purveyance of mind-expanding drugs. NetEnt has clearly taken this as inspiration, and transport us to a martian landscape as the backdrop for this slot. Fitted out in 60s cartoonish fashion (think The Beatles’s Yellow Submarine) our game symbols include a Peace symbol, Vinyl Records, Hearts, Flowers, Eyes, and star spangled 10s through Aces. 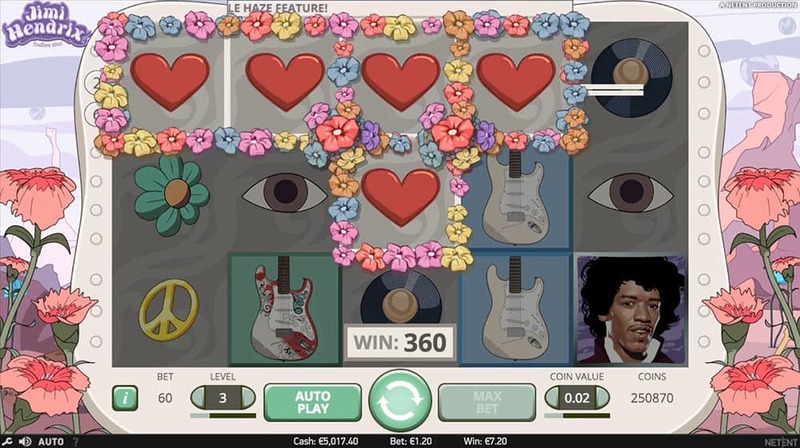 Winning combos across the game’s 20 paylines sprout flowers in and around the winning symbols, with Jimi himself fitting as the game’s Wild. But the base game’s Wild symbol isn’t the only time Jimi pops up on our reels. He enjoys more costume changes than Beyonce in his guise as this slot’s various Scatters. Landing three purple-clothed Jimis launches the Purple Haze feature, sending all our low symbols WIld. 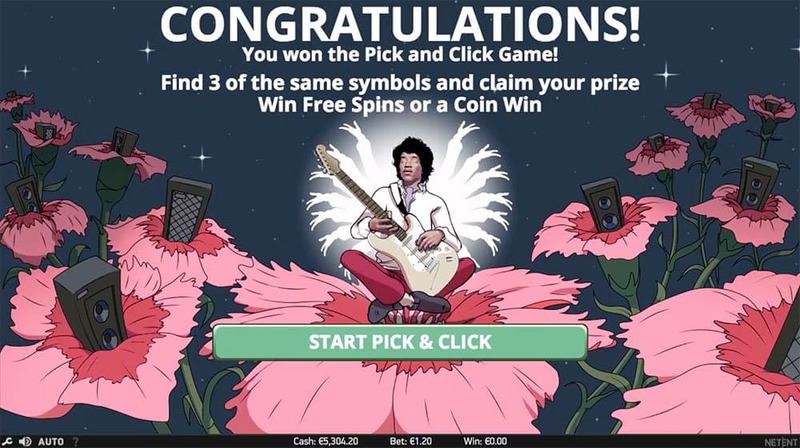 Three white-clad Jimis triggers the Jimi Hendrix slot’s Pick and Click Feature, which will land us coin wins with a multiplier up to x30 or entry into one of Jimi Hendrix’s three Free Spins features. 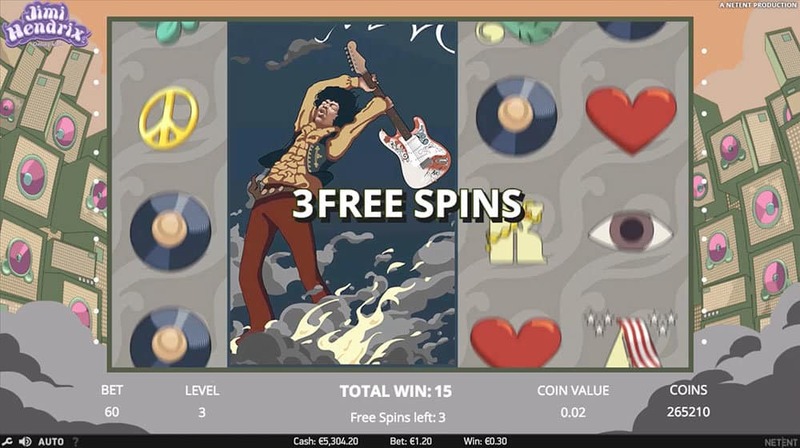 The Crosstown Traffic Free Spins, Little Wing Free Spins and Purple Haze Free Spins each offers between 6-12 free spins. Each of these free games variants delivers either Wild Reels, added Wilds or overlay Wilds for the duration of the free games, sending us, and Jimi, into retro heaven. And then we have the Red Guitar Respins feature. Four Red Guitar symbols will see the reels respun in our hunt for more high-paying Red Guitars. 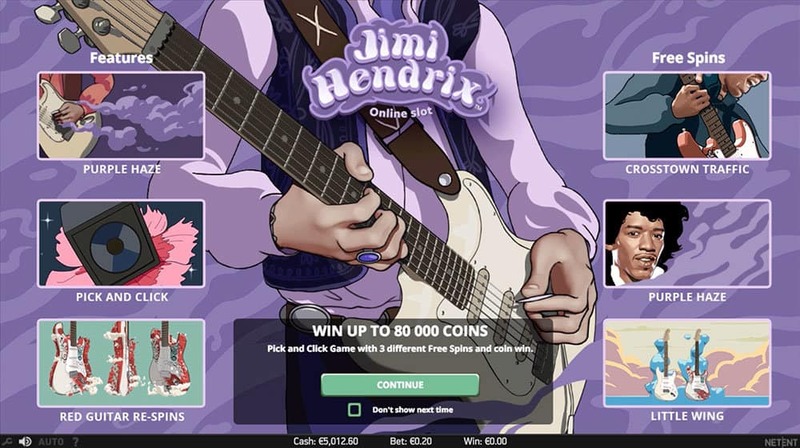 As the second instalment in the NetEnt Rocks Tour, the Jimi Hendrix Online Slot™ is well worthy of the billing. With as many bonus features as Hendrix had hits, this release is a feather in NetEnt’s cap and a gem of the tour. The psychedelic moonscape is a delight, as is the tribute to the swinging 60s. This slot has got what it takes to whisk us on a serious journey through our souls, collecting mind-expanding wins along the way.